Telecom-News: EU 5GPPP- 5G IA elected its new Board for a term of two years until October 2020. EU 5GPPP- 5G IA elected its new Board for a term of two years until October 2020. BRUSSELS – October 23, 2018 – At its recent General Assembly, 5G IA elected its new Board for a term of two years until October 2020. The eleven companies represented in the Board are: Orange, Telecom Italia Mobile, Telenor, SES, Nokia, Ericsson, Huawei, Thales, Nextworks, InterInnov and CTTC (Centre Tecnològic de Telecomunicacions de Catalunya). For more information please visit: https://5g-ppp.eu/5g-infrastructure-association/. 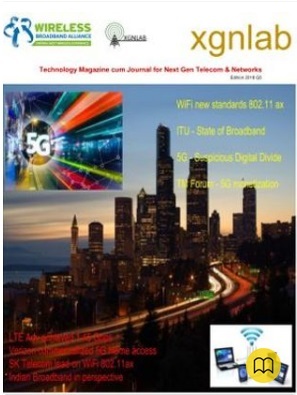 They are key stakeholders from the ecosystem and membership of 5G IA – https://5g-ppp.eu/our-members/. 5G IA's leadership includes also Jean-Pierre Bienaimé, Secretary General, in charge of the overall visibility and management of the 5G IA, and Alessandro Bedeschi, Head of Office, ensuring the operational well-functioning of the 5G IA. Scaling up for 5G , CommScope to buy Arris. Mr Ulf Ewaldsson moves to T-mobile from Ericsson is over crossing the hype of 5G itself. Google to launch pixel 3 and 3XL handsets, in october. Huawei teamed up with Beeline in Russia to show off the power of 5G through holographic call demo.